On Friday, March 20th 2015, a meeting was held addressing the field of EU citizenship and labour law compliance. Despite the fact that EU citizens working in another member state are entitled to equal rights, in reality this is not always the case, as many cases of serious labour law violation show. In the end, this is a threat also for the local standards in the area of remuneration and labour law. Concerning third-country migrants, the situation is usually even more complicated. Having this in view, certain new European directives connected to the labour law were presented, and a discussion was held as to the options various institutions (labour inspectorates, EURES, The Ministry of Labour and Social Affairs) have in supporting the compliance with labour law. 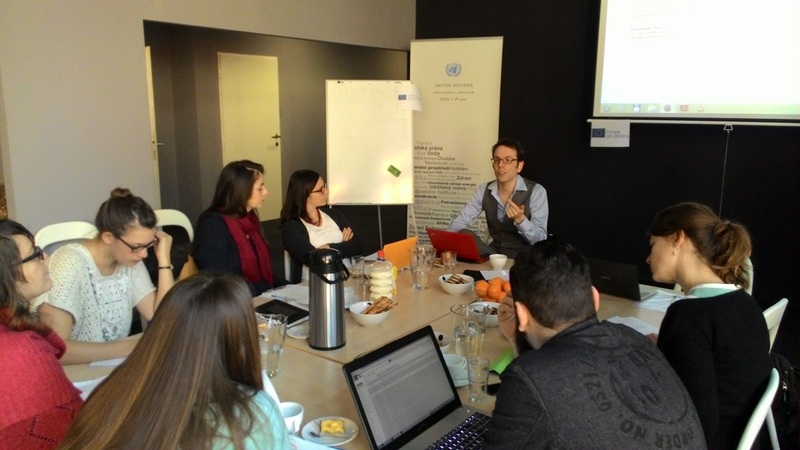 The meeting was held within the project entitled Testing EU citizenship as "labour citizenship": From cases of labour rights violations to a strengthened labour rights regime, and it was attended by representatives of various organizations from Belgium, the Czech Republic, Italy, Germany, Lithuania and Romania. The new directives on public procurement  that are to be transposed into the legal systems of individual Member States until April 2016, bring about a very significant amendment which might prove helpful in eliminating the worst cases of work exploitation in the area of public procurement. According to the new directive, EU member states must guarantee that public procurement be in line with labour law and comply with agreements on labour law, including certain agreements by the International Labour Organization. Requirements of labour law compliance could also be part of the award criteria of the public procurement, and the contracting entity (government, municipality, public authority) could immediately exclude the offers of such suppliers from the public procurement who have already violated labour law obligations in the past. The details of the new legal framework will of course be based on the specific transposition of the directives into the law of individual member states. For the workers, however, the new directives may bring about certain positive changes. There is a rather different situation though in the case of the new European Seasonal Workers Directive . The directive is meant to facilitate the admission of third-country workers into the EU labour market for the purpose of temporarily limited work contracts (even repeated ones) in selected sectors of employment. No matter that the directive tries to provide more protection to the workers in the relationship to their employer (a complete ban on agency work, for example), at the same time it stipulates significant limitations on some of their rights. One’s residence permit is strongly linked to his or her employment relationship, and a change of employer is allowed only once, while the worker’s work contracts have to immediately follow without a single day not being covered by a work contract. Furthermore, seasonal workers are not to be entitled to social benefits in unemployment or to the right to family reunification, not even mentioning the right to social benefits to family members. The maximum duration of seasonal work can be up to 9 months, which raises doubts on the very definition of the nature of seasonal work. Regarding the implementation of the directive, it will be crucial which employment sectors will be included. From the point of view of labour rights, it is desirable that the regime of limited rights of migrants (that being the case here) be applicable to as small amount of employment sectors as possible, and that as many migrant workers as possible enjoy full citizenship status. The implementation of the directive into the legal systems of individual EU Member States, which according to the Directive will be accomplished in September 2016, will show to what extent the Directive benefits or harms the migrants’ labour rights. In the following discussion, the participants had a closer look at the role of various institutions in the field of migrants’ labour rights protection. It was repeatedly said that in the Czech Republic, foreign workers show no tendency to join the trade unions – notwithstanding the fact that they are entitled to do so regardless of their residence status. Migrants’ lack of willingness to organize in trade unions may follow from the temporariness of their residence, but also from the lack of communication by trade unions to the migrant workers. From the point of view of Czech labour inspection, it was said that the monitoring of illegal work mostly focuses on checking whether the workers have a residence and work permit or whether they work on the basis of an employment card or Blue card, and whether they are in a contracted employment relationship. Any monitoring of work conditions and labour relations is mostly limited to the very basic points. An in-depth control of compliance with labour regulations (focusing on labour relations and work conditions as well as safety at work and occupational health protection) is carried out by specialized inspectors. An important source of information for them are complaints and submissions. Labour inspectorates throughout the EU have an information system available through which they share information on the results of their work. In the area of differing national labour legislations, there are troubles with the cross-border enforcement of penalties by customs authorities on those employers who violated labour law. The inspectors, thus, have a very good idea on various practices used to circumvent labour law, but they are limited in their options to prove these practices and prosecute them. When it comes to the communication of migrants with government authorities, according to the words of an EURES representative, the language barrier poses a huge problem: finding an independent translator, without a link to the employer, is difficult and expensive. Furthermore, migrant workers are not very motivated to undergo lengthy and demanding complaint procedures: in real life, financial issues are of the utmost importance for them. When they have outstanding wages, they usually tend to change employers rather than contacting the authorities and seeking help, said a La Strada representative. According to the words of a representative of the Diaconia of ECCB, a huge problem, which enables the (repeated) abuse of migrant workers, is the lack of information for potential migrants who are in search of job opportunities and who are prey to various fraudulent work agencies that profit from their lack of awareness. The meeting was a starting point for further project activities. 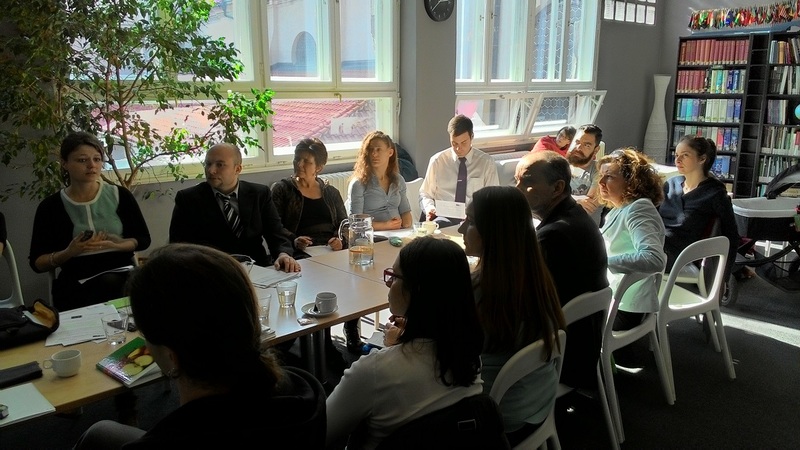 The main focus for the future will be on migrant experiences with serious labour rights violations and the transfer of these experiences to experts and representatives of relevant institutions both on the Czech and European level. The current 2004/17/EC and 2004/18/EC Directives will be replaced by 2014/25/EU and 2014/24/EU Directives. Social geographer, co-founder of Centre for Social Issues - SPOT where he is active as a researcher. Works in MKC Praha as a project coordinator in Women behind the Counter. Transformations of Work and Working Conditions of Domestic and Foreign Retail Workers project.